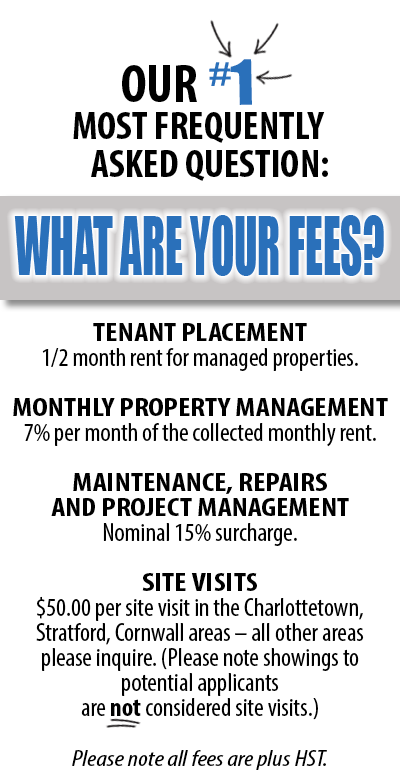 Property Management Services We Provide - RPM Inc. If you’re a PEI investment property owner, we’re here to help and will tailor our services to fit your needs. Please note: we don’t offer “a la carte” services (such as “just cleaning” or “just landscaping and rent collection”) – these services are provided within our comprehensive management of your property. Below are just some of the services we provide to our clients. If you need a service that you don’t see listed here, just give us a call! Find suitable new tenant(s) for your PEI investment property by marketing the property online (multiple websites, digital ads, social media, etc.) and also using our extensive real estate network to find prospects; showing the property to prospective tenant(s); and pre-screening/placing tenant(s) – available as part of our comprehensive property management. Coordinate rental payments – most of our tenants and owners use Interac etransfers which means the rent gets deposited directly into your bank account from the tenant (no waiting for your rent). If a tenant pays by post-dated check, we also deposit the payment directly into your account as a third-party deposit (which again means you don’t wait for your rent). Maintain your investment property, inclusive of tenant management, landscaping, scheduled maintenance, cleaning and painting in between leases, etc. Project Management – We can arrange and oversee repairs, updates or renovations: painting, cabinet installation, countertop replacement, flooring installation, basement finishing, egress window installation to add bedrooms, etc. Arrange and oversee cleanup and debris removal, including after tenant move-out / in between leases, or to prepare a property for renting out. Prep your home or cottage for spring or winter. Perform property site visits (for insurance purposes or simple peace of mind). Research, locate and assist in the purchase of a suitable PEI investment property / sale of your investment property (owner is a licensed PEI REALTOR® with Century 21). Work with Human Resources Departments to help with Corporate Relocation. Assist Medical Professionals with relocation. RPM Inc. adheres to all Island Regulatory and Appeals Commission regulations.